Hip joint injections are safe and effective means of treating chronic hip pain that does not respond to conventional medical treatment. 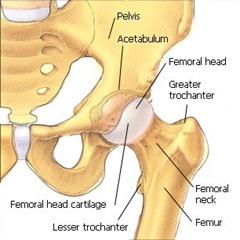 The hip joint is a large ball-and-socket joint where the thighbone joins the pelvis. The ball (upper end of the femur or thighbone) is held in the socket of the pelvic bone by a group of ligaments that form a capsule around the joint. 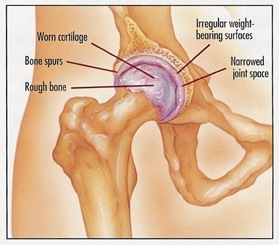 The cartilage between the two bones allows them to move against each other without friction. The most common disease affecting the hip joint is arthritis, a degenerative, inflammatory condition that results in loss of joint cartilage, erosions of the joint, formation of bone overgrowth (or ‘spurs’), and ultimately leads to chronic pain and instability of the joint. Injury or mechanical stress can also result in inflammation and pain in the hip joint. Aside from the joint, the patient may also experience chronic pain in the buttocks, lower back, and leg, which are commonly known as referred pain from the hip. Hip joint injections may be considered for patients experiencing these symptoms. These injections can help relieve the pain, as well as help diagnose the cause of pain. 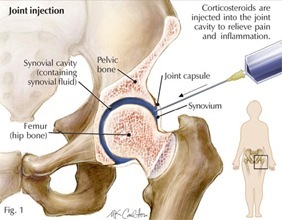 Hip joint injections involve depositing of medicine, consisting of a mixture of a local anesthetic and a steroid, directly into the joint. These injections can help diagnose the source of pain, because by placing the medicine into the joint, the amount of pain relief experienced will help confirm whether the joint is the source of pain. Complete pain relief in the hip joint confirms that this area is likely to be the source of pain. Along with the local anesthetic, time-release steroid is also injected into the hip joint to reduce inflammation, which often provides long-term pain relief. Since the treatment uses locally administered medications it does not have a widespread effect on the body; rather, only painful areas are targeted, and no systemic side effects are expected. A hip joint injection is an outpatient procedure performed by a qualified Chronic Pain Specialist who is an expert with the treatment. The patient is initially briefed about the procedure and prepared beforehand so that he is relaxed. The patient is placed on a lying position and the affected hip is sterilized. After the exact area to be injected is located using live x-ray guidance (fluoroscopy), the skin overlying the hip joint is numbed with a local anesthetic. A needle is advanced into the hip joint. A small amount of water-soluble dye may be injected to confirm proper needle position. Once this is confirmed, a mixture of anesthetic and anti-inflammatory medication (steroid) is injected into the joint space. The needle is then slowly withdrawn. After the procedure, the patient is monitored in the recovery area and discharged on the same day. Upon discharge, they will be asked to evaluate their improvement in the succeeding week and report for follow-up. Repeat injections may be performed up to three times, if needed, every two weeks. A Hip Joint Injection is a minimally invasive, safe, and effective means of treating chronic hip joint pain that is unresponsive to other forms of treatment. If you want more information about treating chronic hip joint pain, contact our Pain Management Specialist who will examine you and conduct tests to determine the cause of your pain. Make an appointment with the NYC’s top board-certified interventional pain management physician to know if hip joint injections are a treatment option for you.